A new comedy from the creator of “Veep” and an inaugural “home movie fest” for Tulsans’ films are highlights of specialty cinema this week. “The Death of Stalin”: Director Armando Iannucci (creator of HBO’s brilliant “Veep” and the equally biting film satire “In the Loop”) gathers an impressive cast for this political comedy showing what happens when Joseph Stalin drops dead in 1953 and his cronies in-fight to become Russia’s next leader. Which is one of the reasons that “The Death of Stalin” plays like a rip-roaring farce. The film concerns the events immediately before and after the death of Josef Stalin, Hitler’s contemporary and kindred spirit, in March 1953. It’s an absurdist depiction of a brutal dictatorship that works wonderfully, in part because it happens at a safe distance. The film, featuring Steve Buscemi and Monty Python alum Michael Palin, is a seriously funny look at the chaotic power struggle among Russia’s ruling elite after the passing of iron-fisted Josef Stalin. His unexpected stroke plunged the nation into paranoia, uncertainty and near civil war. Steve Buscemi found 'Death of Stalin' "less daunting" when he knew he didn't have to put on a Russian accent. Just as history enshrines its heroes, it aggrandizes its villains. The most fearsome perpetrators of evil can become calcified in the horror of their atrocities. It becomes easy to imagine them as stern, foreboding figures who could have only earned their impunity through obsessive, bloodthirsty rigor. MOSCOW (AP) — A Moscow movie theater that had been showing a satirical film about Soviet leader Josef Stalin in defiance of an official Russian government ban canceled further screenings Friday. The Pioner theater's announcement came several hours after Moscow police visited the theater. Police didn't declare the purpose of their visit, but it followed the Russian Culture Ministry's warning that the theater could face sanctions including fines. A Moscow movie theater that had been showing a satirical film about Soviet leader Josef Stalin in defiance of an official Russian government ban has canceled further screenings. MOSCOW (AP) — A Moscow movie theater has shown a satirical film about Soviet leader Josef Stalin despite an official ban. 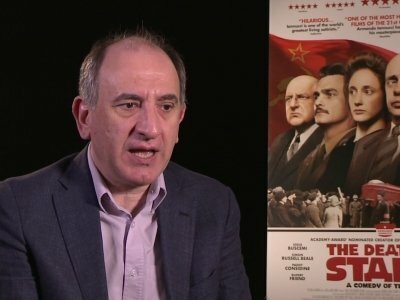 The Culture Ministry has rescinded the permit for screening Scottish writer-director Armando Iannucci's "The Death of Stalin" just two days before its scheduled premiere. The decision followed criticism from communists and others that the British-French production made a mockery of Russian history. Pioner theater showed the film Thursday as planned, defying the ministry's move. English actress Andrea Riseborough ("Birdman," ''Battle of the Sexes") may be the MVP of the 2018 Sundance Film Festival, with four films playing in Park City, Utah. MOSCOW (AP) — Russia's Culture Ministry banned a satirical film about Soviet leader Josef Stalin's death from movie theaters Tuesday following criticism from communists and others that the British-French production made a mockery of Russian history.